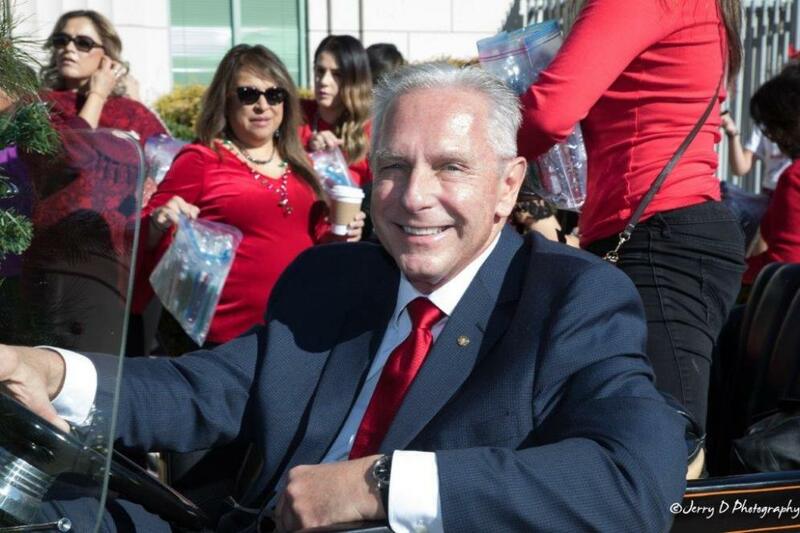 Dr. Thomas J. Kepic, a board-certified periodontist, hosted the largest party of its kind in Upland, CA after serving as Grand Marshal of the Christmas Parade on December 8, 2018. UPLAND, Calif. - Feb. 11, 2019 - PRLog -- TDr. Thomas J. Kepic, a board-certified periodontist, hosted the largest post-parade party in Upland history to thank his loyal patients and all members of the community following his tenure as Grand Marshal of the city's 42nd Christmas Parade on December 8, 2018. The parade rolled under blue skies and pleasant temperatures, as Dr. Kepic, riding in an open-top convertible, waved to the throngs of people who lined the parade route. The parade is an annual event that is co-sponsored by the Cooper Museum and the City of Upland. "When the parade ended, the fun was just beginning," Dr. Kepic said. "I hosted a party at my office, 250 East 7th Street in Upland. As a resident of Upland for 40 years, the party was my way of giving back to the community and thanking them for the honor of selecting me to be Grand Marshal of the parade." Brett O'Connor, Principal at Claremont High School, was very surprised to see approximately 550 guests in attendance. "I was expecting a modest gathering," Mr. O'Connor said. "When I arrived, my jaw dropped. It was an incredible celebration with delicious food and entertainment. There has never been anything like this party in the community before." "Dr. Kepic is known for his integrity, empathy, and commitment to excellence." Mr. O'Connor continued. "These are exactly the type of values we strive to instill in our students at Claremont High School." Another attendee had a unique perspective. Dr. John Mertens practiced dentistry for 47 years before retiring. "Dr. Kepic is the most knowledgeable dentist that I've ever, ever encountered in my days of practice," Dr. Mertens said. "He is not only brilliant--a walking encyclopedia--but he also has skills that are far superior to any that I have seen in any other general dentist or specialist. His party had a tremendous turnout. It was a great day." The sheer size of the crowd also impressed Bob Finkel of Pomona. "I was expecting a small affair," he said, "but it looked like a very large wedding reception—hundreds of people." Mr. Finkel, a long-time patient, credits Dr. Kepic with helping him save his teeth. "Without Dr. Kepic, I would have lost my teeth and I would be looking at false teeth in a glass at night," he said. Among the hundreds who attended the party was one patient from San Luis Obispo, Mary Anne Stephens. "I still drive over four hours one way to see Dr. Kepic," she said. "He is the best and I would not go to any other periodontist. He helped me get over my dental phobia. I trust him completely." Dr. Kepic noted that it was gratifying to see patients who did not know each other mixing and mingling at the party and having a good time. "I have been in practice for over 40 years, and I am truly committed to my patients. I plan to practice for a number of years to come." Dr. Kepic's office is accepting new patients. A doctor referral is not required. For questions about Dr. Kepic's services contact Dr. Kepic's office at (909) 982-4169 or via e-mail at tjk@tomkepic.com. Visit Dr. Kepic at http://www.tomkepic.com. David Schwab & Associates, Inc.